LivingWell Nutraceuticals Super Joint Support Review | Does It Work? LivingWell Nutraceuticals Super Joint Support Review – Is This Product Safe To Use? 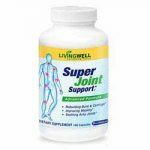 What Is LivingWell Nutraceuticals Super Joint Support? This product belongs to groups of many supplements that are made of chondroitin, glucosamine and methylsulfonylmethane (MSM) as key ingredients. What is the Company Behind LivingWell Nutraceuticals Super Joint Support? What are the Ingredients Used in LivingWell Nutraceuticals Super Joint Support? How Super Joint Support Work? What are the Pros of LivingWell Nutraceuticals Super Joint Support? What are the Cons of LivingWell Nutraceuticals Super Joint Support? According to the manufacturer of this supplement, the ingredients used here have been mixed in the right proportions to enhance the efficacy of improving joint pain. The supplement is manufactured by Living Well Nutraceutical Company, Burlington, Vermont. There is however lack of information as to whether the facility that produces this supplement is also within the facility or not. How Does Super Joint Support Work? The principle behind the working of Super Joint Support is supplying the body with essential nutrients and enzymes for joints, bones and cartilages to repair damages brought about by aging, rigorous activities, and aging. The inclusion of patent Bio Cell Collagen is meant to repair the process so as to improve mobility and flexibility. Chondroitin, Glucosamine and MSM also contribute to this process by improving lubrication of the joints thus reducing friction during movements. The recommended dosage for daily intake of Super Joint Support is 6 capsules per day. Take 3 capsules in the morning and 3 capsules in the evening. There is no published research or any publication of clinical studies regarding the efficacy of Super Joint Support in dealing with joint pain. The only research published on their site is that of individual ingredients. There is no publication of any scientific and clinical study in regards to the efficacy of the products to dealing with joint pain and inflammation. Te manufacturer claims that this supplement is right for you but there is no clinical study has been included to support this claim. What Should I Expect When Taking Super Joint Support? The manufacturer promises that this supplement can help you deal with your joint pain and inflammation. But then you need to be aware that it could as well not work for you since there is no surety based on clinical studies. Will Super Joint Support Show Results? Similarly, we’re promised good results by the manufacturer but it remains to be seen whether that’s the case since without any clinical trial we can judge its efficacy properly. Though the manufacturer mentioned two weeks as the period within which you can expect to see results, 3 months is the time indicated by a majority of customers as the ideal period of feeling results. Do not take this supplement if you have a known allergy to shellfish. Though shown to be effective by the manufacturer, this supplement does not still have any unique ingredient when compared to other supplements in the market. Further, the efficacy of this supplement has not been supported by any scientific or clinical study. A supplement with claims of efficacy without them being supported by any scientific or clinical study is simply nothing. You could get some serious important aspects hidden because of the lack of these vital scientific and clinical studies. In fact, the only good thing about this supplement is that it’s bought with a money-back guarantee in case you feel you haven’t had the desired results. I’ve only used it for one month but have found it very helpful in reducing my painful hip.